Protesters demonstrate against the firing of security staff at the 2010 FIFA World Cup in South Africa. Johannesburg, South Africa (CNN) -- Police used stun grenades and rubber bullets to break up a protest by striking World Cup security guards in a Cape Town suburb Thursday, said National South African Police spokesman Vish Naidoo. He said the crowd was very rough and refused to leave when asked to disperse. 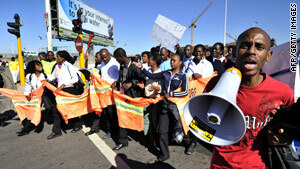 Twelve protesters were arrested for illegal gathering and inciting violence, said Naidoo. The FIFA World Cup Organizing Committee and the South African Police Service agreed Tuesday that police would replace the striking private security at four stadiums for the duration of the World Cup, officials said. In addition, South Africa has set up a court dedicated to offenses related to the World Cup. On Wednesday night, a magistrate in that court sentenced a Nigerian national to three years in prison for unlawfully possessing 30 tickets to World Cup matches, according to a statement from South Africa's National Joint Operational and Intelligence Structure (NATJOINTS). The magistrate convicted Kunle Benjamin on a charge of possessing stolen property after police discovered the tickets were purchased over the Internet and he couldn't give a satisfactory explanation as to how he got them, said NATJOINTS. Benjamin had been arrested Sunday in Pretoria after he was allegedly driving erratically and police discovered the tickets on him.